Druid was up more, but there were new challenges to overcome. This is two months since the coffin bones sank. Druid's weight is good, and he seems to be doing fairly well. His coat is still shiny and he is standing much more. His feet seem to be doing well, but the walls have more waves and rings in them. The odd color on the sole is from Sugardyne; it stained his feet that blood color. Sugardyne is a mixture of sugar and Betadyne and it is used as an antibiotic ointment. 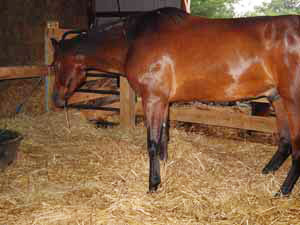 I have switched Druid's bedding from straw to shavings. When I did this, his weight dropped markedly and he became listless. He had been eating the straw because it had more sugar in it than his hay. Nothing else in his diet has changed. 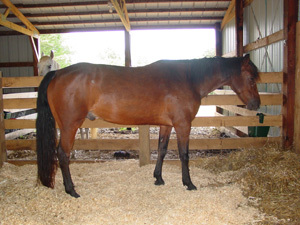 His diet consisted of Beet Pulp without molasses, hay that was very low in sugar and Quiesscence (a Magnesium and Chromium supplement). 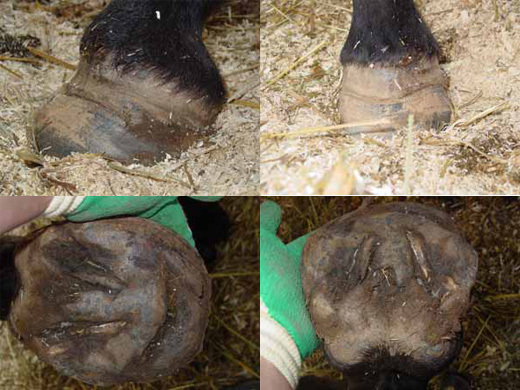 The outer hoof wall continued to grow at a very rapid rate, and the soles continued to look strange. 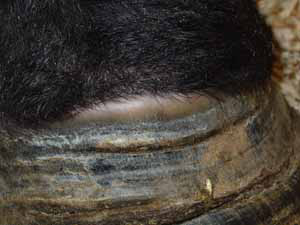 By leaving the hooves un-wrapped, they hardened off and made it a bit more comfortable for him to bear weight. Whenever I soaked him, they softened so much that it hurt him to stand. This month is when the abscesses started. The coronary bands would bulge prior to blowing an abscess, so I knew exactly were it was going to drain. 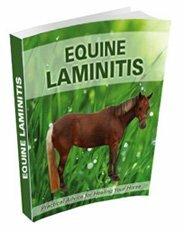 I talked to the vet about lancing these to relieve the pressure, but she said that it just is not effective procedure. I continued to soak him. This was a very bad time. Druid had been relatively comfortable until this began. Now when I soaked the feet to encourage the abscesses to blow, it made the hooves so soft that they were painful to stand on. It was hard to know what to do. I was bringing the toes back and taking the heels down as low as I was comfortable. The proud flesh finally keratinized and fell off. The bottom of the feet lacked all landmarks. Here is a comparison of the two different X-rays one from before sole penetration and the other three months later. It is amazing how much sole this guy has grown in three short months. The sole was still soft, but at least it was thick. According to the X-rays, I could have taken the toe back a lot further. I will state again that it was the only hard structure left on his feet, so I did not have the courage to rasp it back. He was also walking on his toes. I hated to take them away from him.